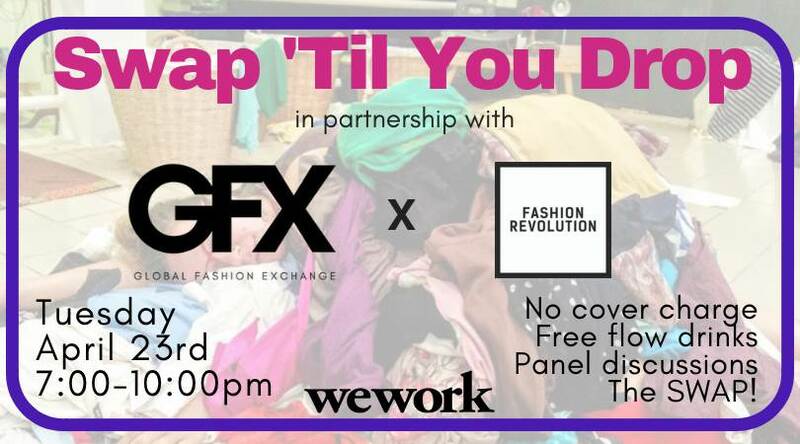 Join us on the 23rd of April, from 7-10pm for the first ever clothes swap at WeWork, hosted by Global Fashion Exchange in partnership with Swap ‘Til You Drop! We will have the opportunity to listen to some sustainability supporters in Bangkok such as Ms. Sutheeta Choonharas, Assistant Managing Director (Pankan Shop Operation) Pankan, a sharing society, where buying is giving under Yuvabudhana Foundation; Passawee T. Kodaka, Founder and Folkcharm, Co-Country Coordinator Fashion Revolution Thailand; Carla Soledad Rivera, founder of The HOME BKK and Soledad Designs, and Madeleine Recknagel of The Sustainable Self. On April 19 from 11am-2pm and 5pm-8pm, we will be accepting drop-offs to screen your items by quality, brand and condition. We will then give your tickets per item via e-mail and you will bring that e-mail to the event to redeem your item tickets to SWAP! Register at OnePlace for your ticket!